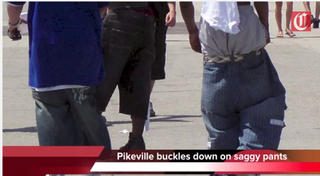 If you're walking around Pikeville, Tenn., you may want to make sure your pants are properly on your hips and belt up as a double precaution … or you could soon be hit with a $25 fine or more, the Times Free Press reports. Last week the City Council unanimously approved the first reading of the ordinance, penned by Mayor Phil Cagle, declaring that offenders who wear their pants “more than three inches below the top of the hips (crest of the ilium)" are guilty of public indecency, the Free Press notes. First-time offenders will be fined no less than $25, while repeat offenders will be slapped with at least a $50 fine for each subsequent offense. "Myself and the City Council, we wanted an ordinance passed in black and white that our officers know what to tolerate and what not to tolerate," Cagle told the news site. "Now they know what we expect, and they know how to handle it." The ordinance has to go through three readings before it passes, so it may be a few months before the ordinance becomes law and is enforced. The ordinance also cites public health as reason for banning saggy pants. "There is evidence that indicates that wearing sagging pants is injurious to the health of the wearer as it causes improper gait," the ordinance states, according to the Free Press. Pikeville isn't the only place that has looked into fines for particular ways of wearing pants: Areas of Georgia, Mississippi and Alabama have passed similar legislation. "All I know is, we just don't want them running around half naked on our streets," Cagle added. "That's the bottom line."